These days, most of us living in wealthy nations expect to reach our destinations quickly, comfortably, and at a low cost. With the ongoing advancement and scaling of new technologies, this has usually been the case; that is, apart from growing problems associated with traffic, increasing security measures at transport hubs, and the still largely ignored “external” environmental costs of burning fossil fuels. With all that in mind, here’s a new, fast and efficient transport project in Europe with a serious clean technology boost. 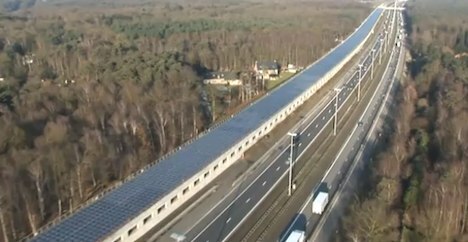 Here we have the recently opened high-speed rail tunnel on the line between Paris and Amsterdam, which is covered with over 16,000 solar panels. This is a large-scale project that combines two clean technology elements in one: high-speed rail and solar panels. The tunnel over the high-speed railway line itself has been built to avoid the need to cut down trees in an ancient forest close by, to protect the high-speed trains on the line from falling trees. The solar panels will provide power to the Antwerp train station and the Belgian train network. Power generation from solar cells is being used more and more for commercial and domestic purposes worldwide. It’s only recently that we have been starting to see solar being used for large-scale projects such as this, as the cost of solar technology continues to fall. No doubt we’ll be seeing a lot more of this kind of project over the coming years. This is the first ever solar-powered railway tunnel in Europe. The tunnel will help cut down significantly on the railway’s carbon footprint by saving around 47 million tons of CO2 emissions in the next two decades.